We entered into a little piece of U.S. presidential history yesterday. We visited the Gerald R. Ford Presidential Museum and passed by President Ford's flag-draped coffin. We got into the DeVos convention center at 4:00 p.m. and after approximately 3 hours in line made our way across the Grand River into the museum. On our way in, John "Jack" Ford and his wife were coming out and we got to shake his hand. He seemed genuinely thankful for those coming to commemorate his father. On crossing back over the Pearl Street bridge, we saw that the line was incredibly long and we estimated that people would be in line until about 2 a.m. before they entered the museum. 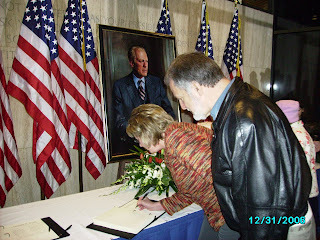 In the picture above (taken Sunday afternoon), Julie is signing the condolences book. We asked some strangers to take our picture and e-mail it to us. They did, along with some other neat pictures they had taken. On a restaurant window near Rosa Parks Circle we saw a sign that read "Gerald 'Our' Ford." Grand Rapidians are honored by the service and legacy of this good man. President Gerald R. Ford will be buried in a small grassy knoll flanked by pine trees just to the north of the museum. Update: The park authorities report that 57,000 people viewed the former President's coffin. You folks were blessed to be there, John. A very touching tribute and ceremony here for truly, as you say, a good man. I look forward to getting over there again. A terrific tribute to a life lived well. I thought of you and Julie this week as the national media focused on Ford. It occurs to me, though, how fickle our media is. Running to spotlight Ford as a stumbling bumpkin, then praising him as a man of grace. Makes me wonder about Howard Dean and the treatment he rec'd.